Situated in prestigious Highland Park within the Bradfield School District, 4324 Bordeaux Avenue is a rare opportunity to build a new home of your dreams or remodel to your perfection a fabulous three-story traditional residence nestled on a gorgeous 0.615′-acre double lot with mature lighted trees and stunning drive-up appeal. Featuring a slate roof and brick exterior, details include spacious entertaining rooms with elegant proportions, gleaming hardwood floors, deep molding, gorgeous wall coverings, exquisite lighting treatments and gorgeous marble finishes throughout. The home offers equally comfortable spaces for intimate living and for large scale gathering and entertaining as well. The wonderful residence offers approximately 5,930 square feet, six bedrooms, eight baths, four gathering areas, two dining areas, five fireplaces, a wet bar, enclosed patio, and a gorgeous outdoor entertaining oasis, including a veranda, wonderful pool, cabana, putting green, beautifully landscaped grounds, basketball net, two-car detached garage with guest quarters, and an automatic gate. Through the oversized double wood doors, with its leaded glass transom window above, the dramatic entrance hall gleans with ornately-carved cove molding, paneled walls with a hidden closet, dual crystal-and-bronze sconces and gorgeous black-and-white marble-patterned floors. Providing great entertaining flow, the front foyer is flanked by the formal living room and also leads to the rear of the home. Centered by stunning marble fireplace, the oversized living room showcases a gorgeous crystal chandelier with an ornately-carved ceiling medallion and cove molding, handsome hardwood floors and paneled wainscoting. Large windows, with exquisite wall coverings, also provide scenic views of the front landscaped grounds. Framed by a marble fireplace, the exquisite dining room is graced with gleaming hardwoods, exquisite wall drapery and also provides views of the enclosed patio and gorgeous backyard grounds. Next, the spacious chef’s kitchen boasts Corian counters, an immense island with breakfast bar, premier stainless and paneled appliances, including Thermador, Bosch, Dacor, and SubZero, abundant storage space, an adjacent utility room, and a bar serving area to the morning room. Fully equipped, the utility room houses a stainless steel sink, abundant built-ins with a desk area, huge service closet and also provides room for a full-size washer and dryer. A door also opens to the outdoors. Capped by a beamed ceiling and illuminated by a brass chandelier, the morning room also features brick walls, handsome Versailles-pattern hardwoods, light-filled floor-to-ceiling windows and French doors opening to the backyard grounds. Conveniently serving the space is a marble-topped wet bar, which is replete with a mirrored backsplash, bar sink, stainless steel ice maker, wine racks and abundant storage. The morning room also flows to an oversized paneled great room, which is the heart of the home. 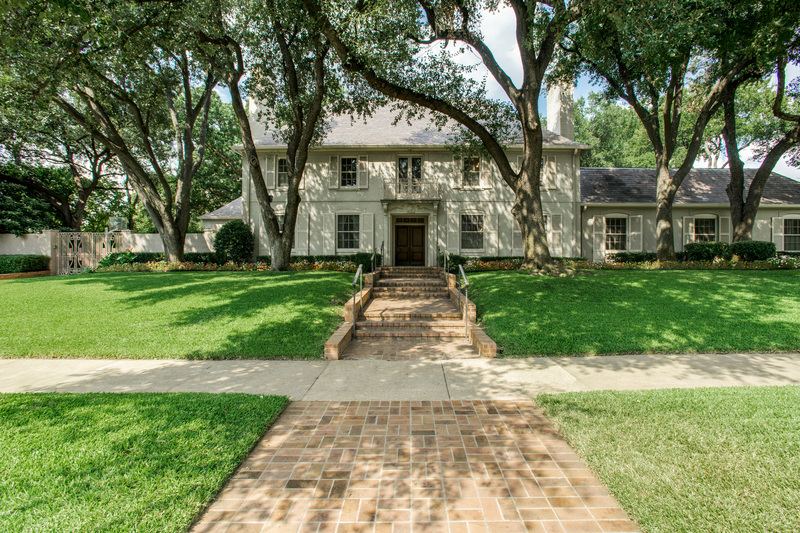 Centered by a marble-surrounded fireplace, with a raised hearth and a wood-carved mantle, the morning room is also appointed with built-ins, floor-to-ceiling windows and double French doors also open to the fabulous backyard grounds. An intimate, richly stained paneled study reflects its purpose with built-in bookcases with storage and handsome hardwoods floor the room. The study is also highlighted by a granite-surrounded fireplace, with a wood-carved mantle, a bronze chandelier, and a large window, with elegant drapery, overlooks the front landscaped grounds. The study allows entrance to the luxurious, oversized master suite, which showcases a graceful 14-foot tray ceiling, a large sitting area, bay windows with elegant silk taffeta drapery, neutral carpeting, and built-ins. Sliding doors conveniently open to an enclosed screened patio, which leads to the backyard grounds and features brick flooring and a heater. The nearby gorgeous His and Hers marble master baths are appointed with a huge center walk-in closet with custom built-ins. The “Hers” bath boasts a large vanity, a vanity desk area, jetted tub, double steam shower and elegant wall coverings. The “His” bath is also replete with a large vanity and a double steam shower. An exquisite marble bath, with elegant wall coverings, rounds out the first floor. Second level of living is equally spacious. Neutral carpeting continues into an oversized den-game room, which is centered by a brick-surrounded fireplace, with a wood-carved mantle, and is surrounded by floor-to-ceiling windows providing an abundance of light. A door also opens to the outdoors and a spiral staircase leads to the first level of living. Five additional second and third floor bedrooms range in size and style, all with large walk-in closets and are served by five elegant baths. One of the bedrooms serves as a second master suite, featuring His and Hers separate marble baths and another with double French doors opening to an iron-grilled Juliet balcony. Outside, the backyard grounds set the tone for a sophisticated atmosphere for entertaining. An exceptional outdoor entertaining area showcases an expansive veranda overlooking a wonderful pool, a cabana with spa, wet bar, changing room and marble half bath, beautifully landscaped backyard grounds with a putting green, a basketball net, and a two-car detached garage with guest quarters. The guest quarters reveal a spacious paneled living area with a full bath, sauna and a built-in walk-in closet with an oversized safe. An automatic gate completes this fabulous residence.